Hsien-tzu ("Clam"; Japanese: Kensu) and Chu-t'ou ("Pig's Head"; Japanese: Choto) are two typical Ch'an characters. Although they were originally in no way related or associated, they are often depicted on scrolls that form a pair. Their association is probably due to the non-vegetarian habits that they share,which set them apart from the regular Buddhist clergy to whom such habits were anathema. Hsien-tzu is supposed to have been a disciple of Tung-shan Liang-chieh (807-869). He was not a Ch'an monk in the usual sense, however. Dressed in the same rags in summer and winter, he roamed the riverside with his fishing net in search of shrimps and clams, which formed his staple diet. At night he would sleep among the offerings of paper money made to the White Horse Shrine on Eastern Mountain. It was said that he attained Enlightenment while catching shrimp. The identity of Hsien-tzu's companion Chu-t'ou is rather unclear. His name means pig's head and he is usually shown eating a pig's head or holding one in his hands. He is usually said to represent a certain Chih Meng-hsu who was fond of eating pig and was therefore called "Pig's Head." There is nothing in Chih's biography, however, that could justify his inclusion in the Ch'an pantheon of eccentrics. Today the face of a Bodhisattva. There is not a shred of difference. When he went to Master Tao of Wen-shu, who was to become his teacher, the Master asked him: "What did you see when you were about to slaughter that pig? What made you shave your head and depart on a pilgrimage?" Ssu-yeh thereupon made a gesture as if he were whetting his knife. 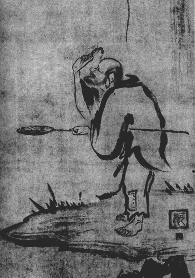 Another possibility is that the representation of "Pig's Head" was inspired by an anecdote from the life of P'an-shan Pao-chi (720-814), a pupil of the great Patriarch Ma-tsu Tao-i (died 788). One day he saw a man in the marketplace enter a butcher's shop to buy meat. He heard him ask: "Please cut me a catty of the finest." The butcher dropped his knife, picked it up again and said: "My dear sir, what do we have here that is not of the finest?" Upon hearing these words Pao-chi suddenly attained Enlightenment.